Satisfactory academic progress (SAP) is used to define successful completion of coursework to maintain eligibility for student financial aid. Federal regulations require each institution to establish, publish and apply standards to monitor a student’s progress towards completion of a degree program. If you fail to meet these standards, you will not be eligibility to receive federal financial assistance in a subsequent term. 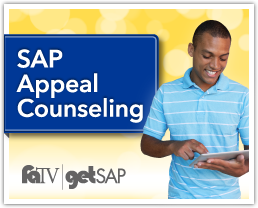 You may choose to appeal your financial aid suspension and may do so by completing a Satisfactory Academic Progress Appeal Form and submitting it to the Office of Financial Aid prior to the term in which you are seeking financial aid. You must create an account to get access to the form. Your academic performance must meet the SAP standards as outlined in the Satisfactory Academic Progress (SAP) Policy. Qualitative Grade Point Average (GPA) (Cumulative): Students must maintain a cumulative GPA list for credit level. The GPA is computed by the Registrar’s office on a scale of 4.0. The GPA is cumulative (includes entire Academic history). Graduate students must maintain a 3.0 GPA throughout their enrollment at FVSU. Quantitative Hours Completed (Completion Rate) (Cumulative): The financial aid recipient must have passed at least 67% of all hours attempted (including learning support attempted hours and all attempts for courses repeated). Grades of A, B, C, or any derivative of these letters are “satisfactory” for financial aid purposes. The completion rate is calculated by dividing the cumulative number of credit hours the student has successfully completed by the cumulative number of credit hours the student has attempted. This calculation is performed in Banner after final grades are posted by the Registrar at the end of the semester. Time Frame: The purpose of the Federal Title IV financial aid programs is to assist students in meeting their educational expenses while they progress toward timely completion of their educational objectives. For that reason, federal regulations require that students must complete their educational objective within a maximum time frame of one and one-half times the length of the program in which they are enrolled. Program length is measured in credit hours and is determined by the number of credit hours required for completion of the program. For example, if a student is enrolled in a degree program that takes 120 semester hours to complete, that student may receive financial aid (if eligible) for 180 semester hours (12 x 1.5 = 180) before financial aid is revoked. Your Financial Aid GPA could be different from your Academic GPA if you have ever repeated a course. Please check with the Office of Financial Aid to get an understanding of your SAP GPA. Disclaimer: This GPA calculator is for unofficial use ONLY. It is intended to be a guide & to assist with determining your status for satisfactory academic progress.